We had a great group of students from Ashley Hall join us on Saturday, September 8 to help prepare the Johns Island Schoolhouse Museum for reopening this Fall. Mrs. Betty Stringfellow, the owner and champion of the Walnut Hill Schoolhouse then hosted us all for lunch at her home at Andel’s Bluff. Maureen Morrisette, a recent Conservancy volunteer with museum experience, showed the students how to carefully handle and clean each exhibit and then document it including photographs. It was great for the girls to be able to see up close old school books, household items and tools. They really got an educational experience beyond their much appreciated community service. Hopefully they can continue their service with the Conservancy over the coming years and see how the schoolhouse museum project progresses. Others continued the clearing work outside including trimming back the hydrangeas so they will bloom spectacularly again next spring. Some vines and shrubs were already growing back from the heavy work done last spring but we kept after it as well as clearing some more. After a few hours’ work, we were all treated to lunch and some story telling by Miss Betty over at her beautiful property on Bohicket Creek. She told of growing up on Johns and Seabrook Islands in the 1930’s and during the War. Before that time, Miss Betty’s grandfather, William Andel, ran a store at Andel’s Bluff for the farm workers and local residents. Before the bridges were built in the 1920’s all the goods sold had to be bought in Charleston and brought down by boat. 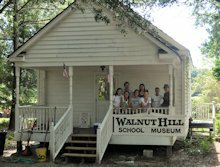 During that time, Marie Andel Hamilton, Miss Betty’s mother, attended the Walnut Hill Schoolhouse.